The Church Council of Greater Seattle, Seattle University’s School of Theology and Ministry and the Archdiocese of Seattle invite you to a regional prayer Week of Prayer for Christian Unity prayer service. 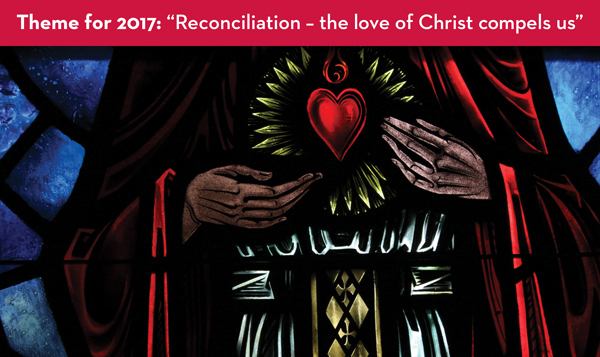 This year’s theme is “Reconciliation – the love of Christ compels us.” Dr. Michael Reid Trice will deliver the message. The Week of Prayer for Christian Unity is celebrated around the world between January 18 and 25. This year is the 500th anniversary of the Reformation. In this context, the Council of Churches in Germany created resources for 2017. They lift up two accents: a celebration of God’s love and grace, the “justification of humanity through grace alone,” reflecting the main concern of the churches marked by Martin Luther’s Reformation; and recognizing the pain of the subsequent deep divisions which afflicted the Church, openly name the guilt, and offer an opportunity to take steps toward reconciliation. The theme this year is based off of a quote from Pope Francis’ 2013 Apostolic Exhortation Evangelii Gaudium (“The Joy of the Gospel”) and 2 Corinthians 5:14 taken in the context of the entire fifth chapter. Please save the date for a community celebration of 100 years of community, service, and justice as the Church Council of Greater Seattle. More information to follow.